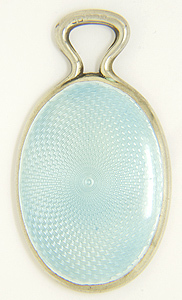 A lovely pale blue guilloche, engine turned enamel provides decoration for the back of this antique oval hand mirror. 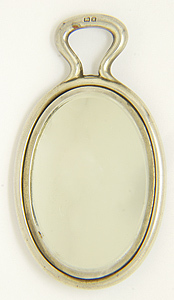 The art deco chatelaine features a simple curved handle that would serve as a chatelaine connector. The front face holds an oval mirror. The piece measures 3 1/4" in height by 1 3/4" in width. Circa: 1920.